Fax: +65 6256 0501 for viewing or updates. Swimming pool, tennis court, sauna, security, basement car park. Near East Coast Park. Hair saloon and mini mart. Opposite Mandarin Gardens condos. Excellent sea views in some units. Tel: +65 9668 6468, 6254 3326, 6254 2728, 9668 6469, 9760 6466. email judy@asiahomes.com now! 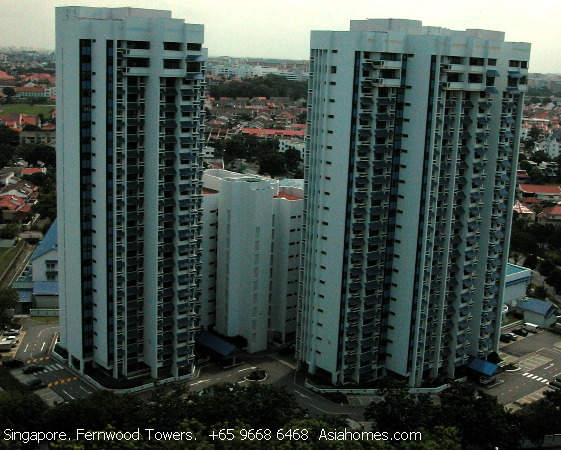 0715 Singapore Real Estate, Fernwood Towers, Rental Houses, Apartments, Condos, Singapore Classifieds, Internet Property Advertisements published by: Asiahomes Internet. For more information on the rental apartments or to make appointments for a FREE house-hunting for expats relocating to Singapore, email Judy tel: +65 9668 6468.